Fox spent most of the day at the Television Critics Association tour yesterday explaining the details of Simon Cowell‘s exit from American Idol and the speculation about whether or not Conan O’Brien would jump ship from NBC to Fox. Meanwhile, another of the net’s hit shows, Glee is quietly undergoing a transformation of its own. Fox Entertainment Chairman Peter Rice and Entertainment Prez, Kevin Reilly confirmed that they’re adding three new characters to the musical-comedy series…and that America would get a chance to offer their input on who they’d like to see join the cast. Glee Idol so to speak. There was an open casting call when Glee was originally auditioning for the roles, Reilly recalls, and he believes letting viewers in on the process is a great way to see who clicks and who doesn’t. In other words…joy and disappointment on a national scale. Rice points out how much it helped define Glee because during those auditions dynamic personalities emerged. Reilly and Rice‘s explanation of why the open auditions benefitted Glee. Reilly and Rice‘s explanation for how the three added cast members on Glee will be chosen. 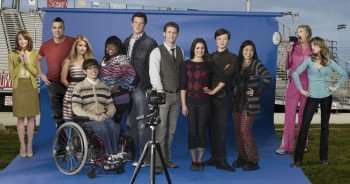 Glee returns from break with fresh episodes on its new night Tuesday, April 13th. More to come beginning next month on the Glee open auditions.